Last Resort Instruments A midwife calls the man midwife only when all her efforts have been futile. Often times the only reason for calling the man midwife at childbirth was because the baby is already dead and needs to be extracted by performing destructive surgical procedures to save the mother. It seems to be a cruel procedure, however it was done as an act of compassion to save the life of the mother. Typically the man midwife was not called until 3 to 4 days or longer after the onset of labor. 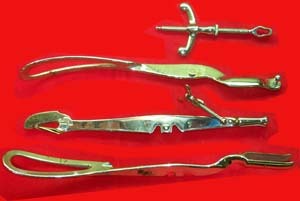 Here are some of the gruesome instruments available to a man midwife at the time. A heavy weight device pierced into the decapitated or intact fetal head for extraction. Unplated steel, 49 cm in length. A huge tire-tete, used to extract a beheaded baby. 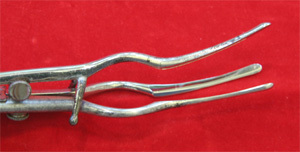 It has four blades to open out and circle the cut off fetal head. Ebony handle with ivory base. 53 cm in length. The pliable blades open up to more than 15 cm in diameter. A see saw tipped extractor placed into the perforated fetal skull for extraction. Unplated steel, 36 cm in length. The rigid fillet was used for difficult deliveries in late 19th Century. It was used for traction for intractable labors. The loop was made of whalebone with the ends fixed in an ebony handle. The loop served as a noose to grab the chin, forehead, groin, leg, or shoulder of the baby. It was used as an alternative to the vectis or forceps. Its use faded through time. 26 x 7.5 cm. Frightful instruments were used to open the head of the infant giving way for other destructive tools like the cranioclast or the crochet to extract the fetus as a whole or piecemeal. This frightful operation was done many times to save the life of the mother. Plated steel with ebony handle. 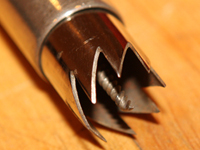 Articulated snapcatch handle lock perforator. Marked "Cizek & Hajsl." Unplated steel. 28 1/2 cm (11 1/4") in length. Unmarked. Exceedingly rare destructive ob instrument. It measures 27 cm. Plated steel. Basilyst A perforator or craniotomy instrument with sharp scissor like edge. The opening can be adjusted with a screw on the handle. It has a checkered ebony handle. Similar to illustration on Bennion's Antique Medical Instruments, 1979, Chap 6, pg 128 Fig 18. The basilyst was used for perforating the vault, and if required, it was advanced to perforate the base of the skull. It has a double thread and split to the point. Unplated steel with ebony handle. 41 cm (15 3/4") in length. Ref. Fig 19.36 p252. Hubbard's The Obstetricians's Armamentarium. It was primarily used for the enucleation of myomas or the removal of cancerous growths in the uterus. It was also documented being used as a last resort for the piecemeal removal of an undelivered fetus. Signed W.F. Ford. From top to bottom: Thomas Craniotomy forceps; Meig's, straight, angular, and curved craniotomy forceps. This was used to bore hole on the fetal skull as a prelimminary process in collapsing the skull with a cranioclast. The instrument had a pelvic curve allowing the crown to be placed over the head. Turning the handle while applying pressure rotated the cutting edge of the crown, thereby trephining the skull. The collapsed head would allow subsequent extraction of the fetus. Plated steel, 44 cm long. This is a rare German destructive OB instrument invented by Zweifel. The Trachelorhektor was illustrated in the Medizinisches Warenhaus catalogue in Berlin published 1910. They call it "Two Armed Decapitation Hook". The pointed stylet is screwed into the sphenoid and acts as a guide for the trephine. 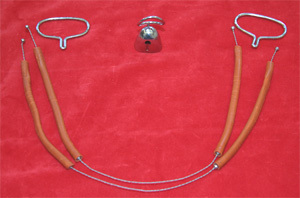 Metal and horn handles. 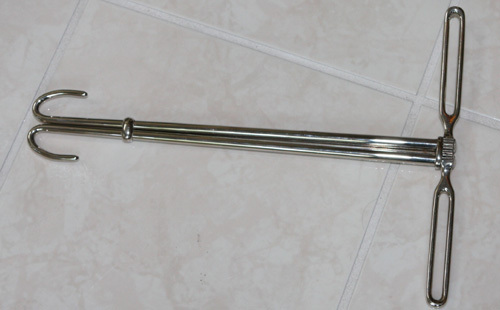 Marked Collins & Co. 43 cm (16 1/2 " ) in length. Ref. Fig 19.23 pg 245 Hibbard's Obstetricians Armamentarium. 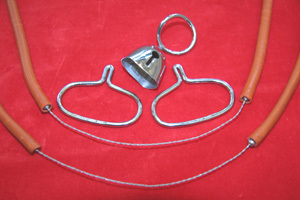 Hooks/Crochets Blunt Hook- In difficult cases, extraction of the head or the trunk utilizes the blunt hook inserted around the neck or under the shoulder respectively. They were also used to alter the position of the fetus as well as to hasten the delivery of breech. 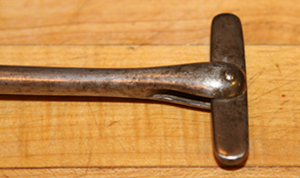 The blunt hook were often used in combination with crochet. 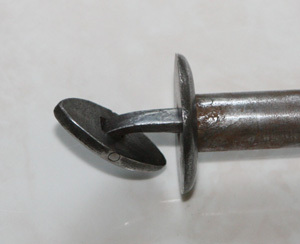 Crochet-A steel hook with a sharp pointed end. After the initial breaking of the skull with a perforator, the crochet was inserted into the cranium and grab hold the base of the skull for extraction. 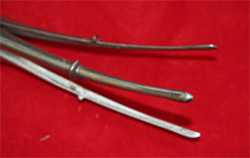 Both crochet and blunt hook were essential for the practicing obstetrician in the late 1600 to late 1800. Unplated steel. Ebony midshaft handle. 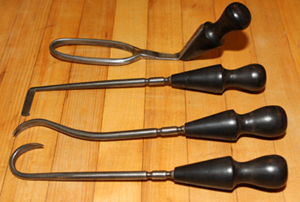 Large and small unplated steel hooks with ebony handle on mid-shaft. Paired Hooks: Black and brown wood handles, Crochet and Blunt hooks. Sets of Hooks, Crochet, and Vectis with detachable ebony handle. Double-toothed crochet, and a sharp hook. Unplated steel with ebony handles. Unplated steel with squared ebony handle. A destructive Obstetrical hook with ebony handle. Assembled and separated. Upper handle and blade is reversible. Crochet were used not only for extraction but also for piecemeal removal of fetal parts like the abdomen and trunk of the fetus. Marked: Tiemann. Fig 3811, Tiemann. Plated steel blades with German lock and ebony handles. Circa. Early 1800's A very rare destructive forceps with notched ebony handles. The blades could be used singly or in combination on the outer side of the fetal head. Illustrated on Joseph B. De Lee, 1st Edition, 1913, Principles and Practice of Obstetrics, Chapter LXXII, Mutilating operations on the child. pg 1006 fig 893 d. Unplated steel, 32 cm in length. Circa 1850s A large and heavy dreadful tool used for crushing the bones of the fetal skull and face. All metal plated steel with English lock. 44 x 20 cm dimensions. A humongous destructive obstetrical instrument. 48 cm (19 inches) in length. Unplated steel. A stunning 56 cm long and heavy cephalotribe. 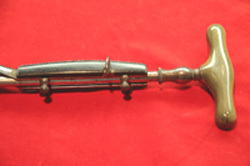 Similar instrument featured in Hibbard pg 239. The crank handle is made of ivory. It is marked "SIRHENDRY A PARIS". Powerful and heavy destructive forceps. 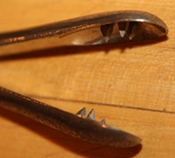 It is similar to the Simpson's cephalotribe except that the grooved blades are spiked. Unplated steel. Large & heavy unplated steel to crush the fetal skull. Unplated steel with ebony handle and English lock. 37 cm (14 1/2 ") in length. Cranioclast A cranioclast is a powerful forceps. 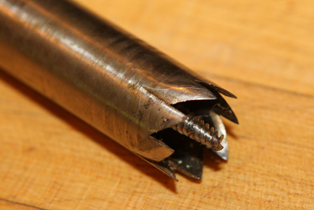 The blades are toothed, fenestrated or grooved. One of the blades passes within the skull of the fetus, while the other is introduced externally to the cranium. Two blades articulate by means of a fixed screw point. Some cranioclasts have separate blades which are joined by a lock similar to an obstetrical forceps. Unplated steel. One handle, hooked, the other scissor type handle. Fixed screw point with ebony handles. is introduced externally to the skull, and contains grooves into which the teeth of the first blade are received. It has a locating pin on the inside of the handles. 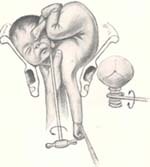 When properly fixed, the extremities of the handles are to be bound firmly by a tie, and steady traction applied to extract the dead fetus. Hooked handle with toothed blade. 34 cm in length. Unplated steel. Simpson's Cranioclast Conceived by Sir James Y. Simpson to replace the cephalotribe. A fenestrated blade positioned on the outer surface of the head, while the smaller solid blade was inserted into the previously perforated skull. The crushed cranial vault was contained within the scalp. It has a ribbed ebony handles with Siebold's lock which allows the instrument to be used in two positions. Marked S. Hawson Thompson, London. Circa 1870's. The olive-shaped end is screwed into the base of the skull, and the hinged blade is passed over the head. 47 x 10 cm in dimension. Ref: Fig 19.34 p252. Hibbard's The Obstetrician's Armamentarium. 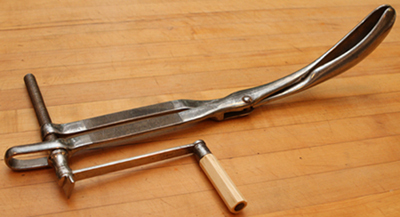 A very rare destructive instrument used to decapitate the fetus in diffiicult labor. 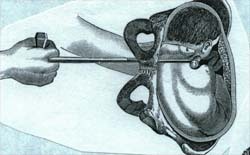 The wire saw is passed behind the fetal head using the thimble. The maternal parts are protected from the saw by a rubber sheath. Handles are connected to both ends of the saw. The blade is pulled back and forth the fetal neck. Signed Lewis Bros London. A combinanation of cranioclast and cephalotribe. The center blade is for perforation and screwing into the foramen magnum. The crushing outer blades are then applied. There is a winged screw compressor and a lock. Plated steel. 43 x 16 cm (17 x 7 ") in dimension. If the cervix failed to dilate for a vaginal delivery, or if the delivery seemed urgent, the accoucheurs in the past stretched, torn, or lacerated the cervix by force to accomplish rapid delivery. The procedure was called "accouchement force," delivery by force. Several methods were used and many instruments were deviced to accomplish it. For failure to progress, the cervix was forcibly dilated. 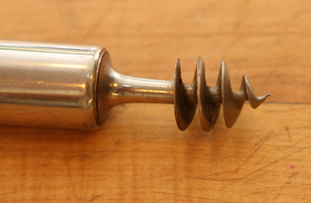 A powerful screw at the handle would affect the handles to separate the cervix. This dilators were popular towards the end of the 19th century, but fell into disrepute because of severe lacerations it produced to the uterus. Signed: Guiseppe Opezzo. 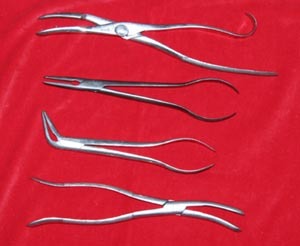 Five bladed cervical dilator, similar to Luigi Bossi dilators. Plated steel, 27 cm in length, 9 cm widest diameter of the blade. Plated brass with four awesome blades. 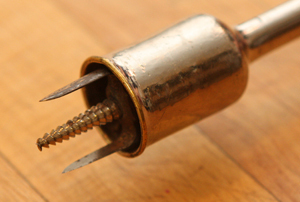 A powerful screw at the handle produced separation of the blades placed in the cervix. 35 cm long. Circa 1890's. 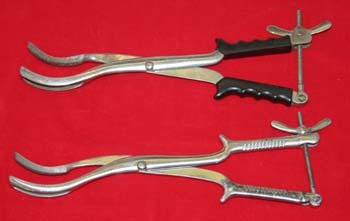 Four Bladed Dilator Similar to Luigi Bossi insrument (1881). Four branched dilator. This dilators was popular for a decade, but because of the cervical and uterine tears it produced fell into disrepute. 39 cm in length. Plated brass. Pressure applied to the tow bladed handle causes the three blades of this uterine dilator to expand evenly. 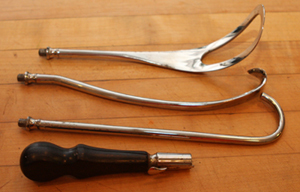 Scissor handle grip with three bladed uterine dilator. Ribbed ebony handles on left. Made by Codman and Shurtleff of Bostorn.